They say musical inspiration can come from anywhere, and for Nashville-based rock critic Dave Paulson, that came in the form of the classic 1995 Chris Farley–David Spade comedy Tommy Boy. After years of working as a rock writer and heading a 1990s-themed cover band, Paulson released his first original, full-length album earlier this week. Titled Sandusky, Ohio, the nine-track album chronicles the travails of Tommy Callahan (Farley) and his triumphant return to his hometown of Sandusky to save the family auto-parts business. Paulson’s album isn’t just inspired by Tommy Boy. It’s a musical retelling of the film. It’s an admittedly bizarre, postmodern piece of art, Paulson tells me. But if Broadway can make a musical based on Bret Easton Ellis’ grotesquely violent American Psycho, then a record based on a lovable loser’s redemption journey seems not only plausible but downright inevitable. I genuinely enjoyed the album. It displays deft musicianship and is legitimately funny, if a tad repetitive. But more than anything, Sandusky, Ohio is superb at evoking the emotional core of Tommy Boy — probably better than the movie does itself. The songs are heartfelt meditations on class resentment, a son trying (and failing) to live up to his father’s image, the fortifying effects of a road trip and the plight of being an incompetent doofus with a big heart. Already, the album is bringing grown men to tears and receiving rave reviews on Reddit. Paulson, who writes at The Tennessean, spoke with me on Wednesday about his curious passion project, and our conversation covered fathers, sons, male friendship, the surprising emotional resonance of the film, what it’s like to go from being a professional critic to having your work critiqued and the chances of a Tommy Boy musical. My first question is the most obvious one: Why? Why make an album about a movie that’s more than two decades old at this point? So I thought, What if I did the opposite—something that’s not abstract and not at all intimidating to a listener? And pretty quickly I arrived at an album about Tommy Boy. Also, I always wanted to do something ludicrous. It’s definitely an accessible topic. People adore this movie. But your album goes beyond the silly Farley physical comedy moments; it’s a pretty emotional record. On paper, Tommy Boy is about a screw-up who needs to prove himself, and we all remember the hilarious parts from it. But there’s a grand arc to the movie. Tommy comes back to his hometown, gets a cushy job. Then his dad dies, and he has to deal with that. He has to grow up fast and prove his worth, fill his dad’s shoes. And I love the journey he’s on. And I love the journey Tommy and Richard [the David Spade character] go on together. They hate each other and learn to get along. In some ways, Sandusky, Ohio evokes those weightier elements of the film better than the film does. Those parts hit me years after I saw Tommy Boy for the first time. I watched it again and realized, There’s more than just jokes. There’s a lot of heart to this movie. That explains why people have such an emotional connection to it. If you go back and watch Wayne’s World, Billy Madison or any other SNL movie from the 1990s, none of them have the emotional core this movie does. How serious are we supposed to consider this album? It’s not deathly serious, capital-A art, or whatever. It’s not a novelty record; it’s an attempt to draw some emotion and inspiration out of an unlikely source. I hope it falls somewhere in between fun and emotional. What’s your personal relationship with the movie? And I didn’t follow my dad into the family business, but I did follow my dad into the newspaper business. Did writing the song about Tommy and his father, “My Old Man,” reveal anything your relationship with your own dad? Not really. But fatherhood has made me think a lot more about the father-child relationship. I know what it’s like to grow up, to be on the path they’re on, and I look at every situation from their perspective. You also play in a cover band, which I must say, pleasantly surprised me. You’d think a professional music critic would be more interested in making “serious” music. This sounds so cheesy, but I want to have fun and for everyone to have a good time. Even in my day-to-day work as a rock writer I try not to be too stuffy. My 1990s cover band, My So-Called Band, is far and away the most popular music project I’ve ever been a part of, for instance. We sell out clubs in town, and people really like it. That experience really set me up to create Sandusky, Ohio. I tried for years and years to be a “serious” musician. And people were nice and polite to me; they sat there in the crowd and clapped when the songs were over. And after a few years of that, I realized it wasn’t what I was dying to do. Then I played in a cover band and started a set with a Third Eye Blind song, and everyone in the crowd was immediately like, Yes! We know this song, we love it, we love you and we’re having the time of our lives. That was eye-opening and made me realize how important it is to find a common ground with your audience. With Sandusky, Ohio, we’re all on the same plane. The album is a very literal retelling of the story in the film. 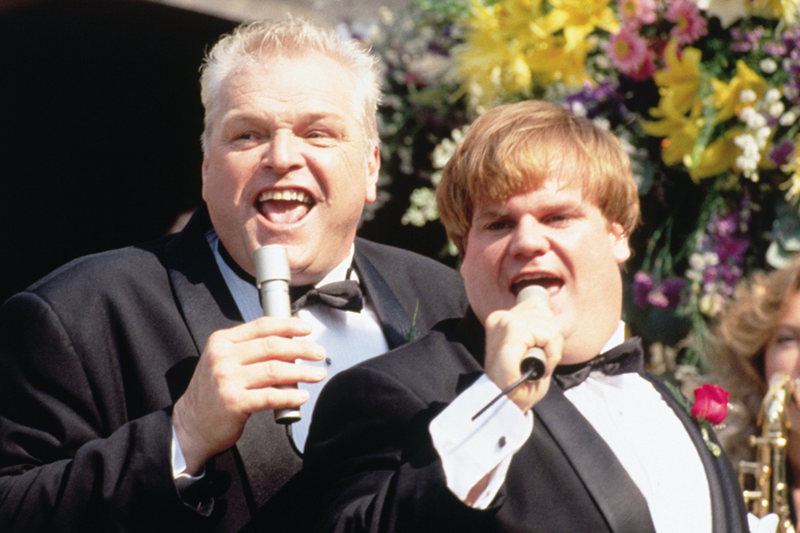 Have you considered a Tommy Boy musical? Absolutely. I’m more than open to it. We’ve reached out to a few people that were involved in the film and haven’t heard back yet. We might need to add more songs to flush out the story, though. I decided early on to keep the record focused to Richard and Tommy, and not include Rob Lowe and Bo Derek’s villain characters. No one likes the villain songs, you know? Listening to your album, it struck me how weirdly prescient Tommy Boy is. A Rust Belt kid comes home to save the family’s small business. It seems to speak to the working-class resentment in our culture today. As I delved into this project, I realized it was sounding like a Springsteen or Randy Newman record. I got to sing about saving the hometown factory. Does it bother you thinking that Tommy Boy might be a Trump supporter were this movie made today? There are many things about the film that would be different were it made today. The entire third act — where Tommy and Richard impersonate flight attendants and sneak on a plane, and then fake a bomb threat to get into an office building — for example. None of that would happen in a post-9/11 world. But you know what? I think Tommy Boy would be the movie to bring everybody together in 2018. I don’t think it’d have a Roseanne problem. And I think that’s happening now with my album. People from all ages and walks of life tell me how much they love Tommy Boy. My album seems to be bringing people together now.